$150 Renewal or $200 First Time Class. 2 year ACLS certification cards through the American Heart Association (AHA). $200 Renewal or $215 First Time Class. 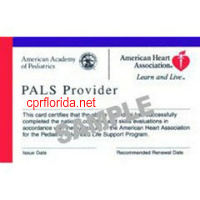 2 year PALS certification card through the American Heart Association (AHA).